In building a growth plan for your firm, perspective is important. Objectives, clearly defined as they should be, should not be overwhelming. Nor should they be adhered to slavishly. It’s often enough to know what you want to do, why you want to do it, and how you plan to get it done. Objectives should be consistent with a firm’s comfort level, and should certainly be ethically acceptable to both the firm and the profession practiced by the firm. Instead, It must have clear objectives that are flexible enough to accommodate the dynamic nature of the market. It must focus on specific aspects of a practice, predicated on the distinctive needs of each aspect of the prospective clientele. For example, a marketing program to attract high asset individuals is different from one to attract corporations. A program to attract real estate developers is different than one to attract builders. Practically, a firm’s growth plan should be in two parts – near-term and long-term. Near-term should be no longer than two or three years. Beyond that, there are too many variables in the economy, in law, in regulations, etc. to be valid – even with the flexibility that should be part of any plan. Longer than that, it becomes a wish list – not to be ignored, but seen for what it is – a long-term goal. The short-term goal, on the other hand, should be action-oriented, with an action plan for each goal, including who does it. Within the context of the market and the firm’s skills, there then follows a readily defined understanding of what the firm and its partners want, both in the near and the far term, and what they hope to have the marketing program and action plan accomplish in pursuit of those goals. An overriding consideration is your decision as to the nature of your practice. What are your growth parameters? How do you mean the firm to serve the personal and professional needs of you and your partners (and not to be overlooked, your staff)? How do you want to be perceived by your clientele? What skills do you have that are marketable and which do you need to acquire? How? What will you demand of your partners and staff? Do you mean to change the firm’s structure or form of governance to be more responsive to the needs of your market? Do you foresee changing from hourly to value billing? What are your target dates, and what is your budget? 1. Firm Environment. Nothing — not even profitability — is more important than the kind of firm you are or want to be. Without a firm environment that’s satisfying and fulfilling to its partners and staff, there will be no growth, no profitability, no future. 2. Size. Businesses usually don’t grow substantially by accident. It’s almost invariably a conscious decision by its partners or owners, who then take steps to implement that decision. However, some professional firms may feel that they want to limit their growth, fully cognizant of the implications of growing and managing a large firm. Growth alone may not be of the essence — even a firm that chooses to stay at its current size must make that a conscious decision. But it should face the fact that in order to contain growth, it must take steps to sustain its size; it must perform marketing functions to overcome loss by attrition. 2. Profitability. Profitability, of course, is as much a function of margins as it is of volume, and so it’s useful to know your costs as precisely as possible — a particularly difficult task in a professional firm, particularly because accounting practices are intellectual products, which are difficult to measure. Profitability becomes, as well, a function of the kind of service you’re offering, and the kind of market you want to reach. Corporate work, for example, may have higher margins than working for not-for-profit organizations. 3. Time Frame. The ability of a car to accelerate — to go from zero to a hundred miles an hour — is measured in seconds. The ability of a firm to meet its firm objectives is measured in a larger time frame. But two things are necessary. First there must be a time frame for the objectives to be met, and second, that time frame must be realistic. It can, however be flexible. It can allow, for example, five years for the firm to double in size, if that’s what it wants, but only two years to expand its market geographically. 4. Pricing. Pricing is as much an element of marketing as is advertising or promotion. Aside from the fact that it affects revenues and profitability, it also affects positioning. The classic question, for example, is do I charge less and go for volume, or do I charge more and go for a more affluent clientele? This is a function of conscious choice, although often, the choice is dictated by such other factors as access to affluent clients, the ability to supply the kind of service needed, or in some cases, simply the ability to ask for and sustain a high fee schedule. Value billing is on its way to superseding hourly billing, which raises the complex question of defining value. But the consideration is value to the client before value to the firm – or there will quickly be no value to the firm. Not to be overlooked is that in today’s competitive climate, pricing has become a tool of marketing, in ways that it had not been before. As in other forms of marketing, pricing is sometimes set by competition, where before it had been relatively arbitrary. A price war, however tends to ignore value, and is often disastrous. 5. Market. There are three aspects of a market that must be considered — its size, its needs, and its location — and all three must be viewed carefully in formulating objectives. How large a market can you realistically serve? What are the parameters of the market’s needs that you’re prepared to serve effectively? What geographical limitations are realistic? Do we have the skills to succeed in a particular market? 6. Share of market. When a firm is in a rapidly growing market, or functioning in an era of rapid growth, share of market is not significant. Growth will come with the market. But when that market or industry slows its growth, and competition for existing business is the only possibility for growth, then share of market is crucial. If the only way to grow is to capture your competitor’s clients, then obviously, your share of market grows as your competitor’s diminishes. Share of market is an equally important consideration in an industrially mature market area, where industry is either stagnating or declining, and where a substantial part of a practice is in the mature industry. Still, within those strictures that dictate strong competition or static markets, growth can come by offering new services to existing clients, or by offering new services to clients of other firms. If market share is meaningful, it’s measured not only in terms of the total practice, but for specific services as well. A major accounting firm, for example, may be only the fifth largest firm in town, but it may have 70% of the market in small business services. And of course, the two classic approaches to increasing market share are price cutting, which is now more complex than merely lowering prices, and is therefore fraught with danger, and improved marketing efforts, which is infinitely preferable. 7. Service concept. As a professional service, your relations with your clients dictate that they are served personally. One major accounting firm opened a second office in the Wall Street area of New York, ostensibly to serve the needs of its financial clients (and to expand its financial clientele.) Another accounting firm opened a branch office in suburban Dallas, to better serve the growing number of smaller businesses located there. The service option, of course, is the firm’s, but it should be made a specific choice. If it’s not, if it’s arrived at arbitrarily, it sends a diverse message to clients, and is counterproductive to a firm’s growth and success. 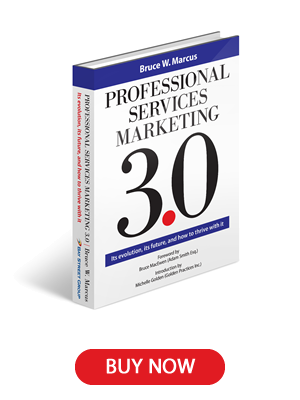 But in the final analysis, the tools and strategies of marketing serve to enhance the practice development process. It’s always wise, also, to consider those elements that are beyond individual control. One can’t control, for example, the economy, which can throw the best formulated objectives awry. An entire accounting practice can be created or destroyed by a legislative change. An accounting practice can be made or broken by a new tax law, or a new FASB change. Opportunities for professionals are generated or obliterated regularly. This is why objectives are never more than guidelines that serve to define a course of action, whether in marketing or otherwise. There’s always the danger, too, of successfully achieving marketing objectives too soon, and thereby outrunning your ability to serve a new or growing clientele. It makes little sense to do a successful job of increasing your tax business if you can’t find a sufficient number of tax specialists to serve your new clientele. Copyright 2011. Used by permission.